Why would you play Risk Legacy? The original Risk game is definitely straightforward in its rules and general setup. Even the different websites where you can play Risk online don’t differ too much from the original Risk game. You simply select an army, place your troops on various parts of the game board, deal out the cards between yourself and your friends, and you begin to play. There is nothing too unorthodox about the original Risk game. But what if you wanted to play a Risk variant that consistently threw the rules out the window and kept changing as the campaign progressed? Now that would be fun. This is where you would take a look at playing Risk Legacy. There are key differences in how to play Risk Legacy compared to the original Risk game, beginning with the main objective of the game. Your main objective in a game of Risk Legacy is to obtain 4 Red Stars. You may try to conquer the entire world if you wish, but as long as you don’t have 4 Red Stars, the game will continue. 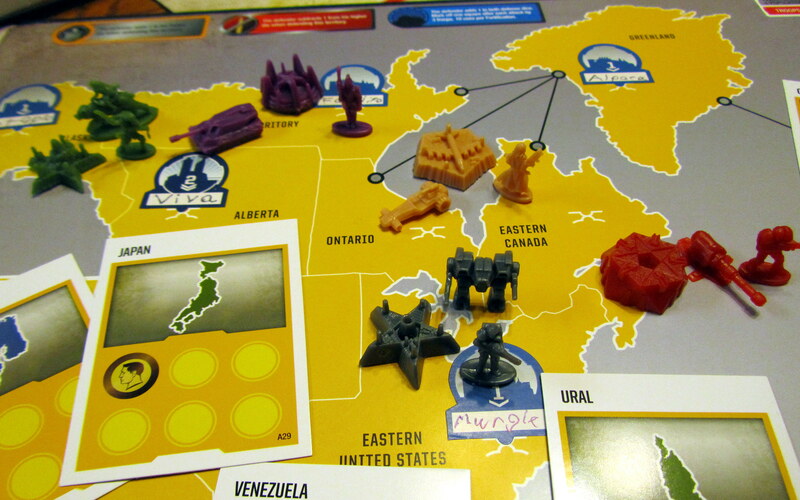 The main campaign of Risk Legacy is typically made up of 15 games being played. Whoever has the most success in the majority of 15 games will be declared the winner of the campaign. All players will roll a single die and whoever rolls the highest number will have the first pick of a faction. There are 5 different factions to choose from. Your choices consist of the Die Mechaniker, The Saharan Republic, the Imperial Balkania, the Enclave of the Bear, and Khan Industries. Each of these factions has specific powers that affect play on the board differently. When choosing a faction you will pick up a Faction Card and put a sticker on the green box of that Faction Card. You will have 2 choices of powers for your factions, and the choice that you don’t implement will be ripped up and thrown away. You will then place your faction on a certain part of the board, and you will designate one part of your faction’s territory as the official headquarters. You will start out having 1 of the 4 Red Stars that are needed to win the game. The game will officially begin once all players have placed their units on the board, and turns will be taken in clockwise order. You will obtain a Red Star if you can gain control of an opponent’s headquarters or simply by turning in Territory Cards. Each game of the main campaign changes as players won’t be stuck playing as just one faction throughout the campaign. Players can always change their factions from one game to the next. At this point of play, the freedom to customize your campaign truly shines. By winning a game you will be presented an abundance of options which range from founding a city to renaming a continent. Even if you lose a game, don’t worry. You will also get to found a city or make improvements to a territory. 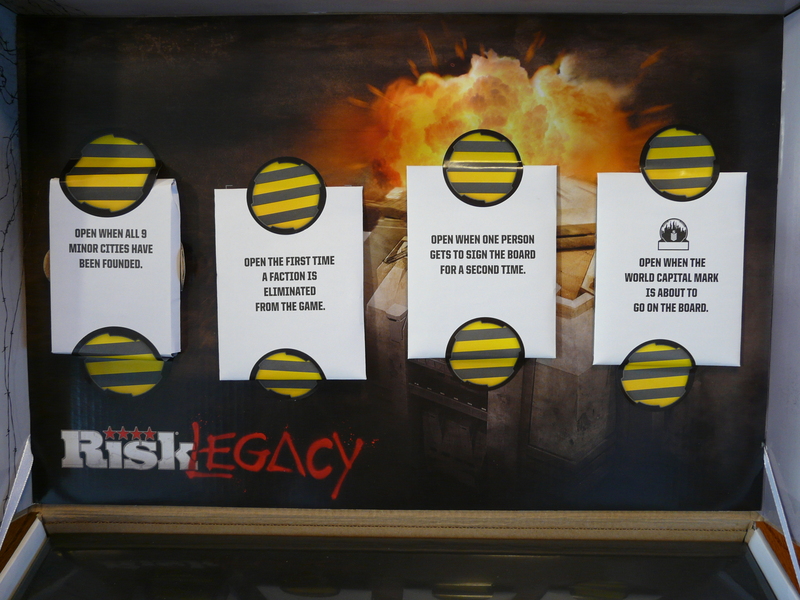 Risk Legacy is a game that teaches you that consequences will be attached to the choices you make. As long as you record the data of all that goes on in every game of the campaign, you and your friends will be able to play a complete campaign. Between every game make sure to ask some key questions. Who won the first game? Who still hasn’t won after playing 5 games? What interesting features are there to claim on the customized Risk board game? Are there any unlockable features in the campaign? How often do all players unlock new features? Make all these kinds of potential changes mean something when you play, whether you treat them as the most significant changes in the campaign or not that significant at all. One thing to keep in mind in Risk Legacy is how you pace these changes. Study player tendencies as well as the flow of a game to know where the campaign is headed. What are Scar Cards? All players will shave a Scar Card at the beginning of a game. When played these “scars” serve as permanent changes. For example, if Australia is awarded a free reloading of unlimited ammunition, then that will be the case for every game you play in the campaign. The unique thing about Risk Legacy, though, lies in the fact that you have 4 sealed white packets when you open the game box. There are specific instructions that you will have to follow before you can open these packets. The mysterious presence of these packets alone expand the replay value of Risk Legacy. It is also worth noting that on the Risk Legacy Sticker Sheet you will have 4 Scar Removal Stickers. This means that by placing this kind of sticker on a scar that is on the board, you essentially remove the effects, whether good or bad for you, of that scar. As far as expanding your empire and moving your troops on the board, the same rules of the original Risk game basically apply unless specific features of your faction are implemented which allow your troops to move anywhere they wish. You will have a minimum of 3 reinforcements to place on the board at every turn. Resource Cards, also known as Coin Cards, have various money values on them. When you begin to play you will have 1 Resource Card. 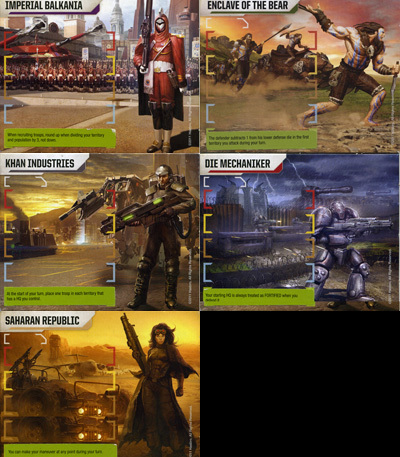 There will be a designated track for 4 special Resource Cards in a single line, and the only way you can take a special Resource Card is by having a unit that controls a specific territory. Otherwise, you will need to take a generic Resource Card from the deck which amounts to 1 coin. There a few unique ways that you can use Resource Cards. You can use the money value on them during the recruitment troop phase, and with the help of the troop chart that is displayed on the board, you can get additional troops to build and strengthen your empire. At the start of your turn, regardless of how much money value they carry, you can trade in 4 Resource Cards in exchange for 1 Red Star. Before the end of your turn, you can select one Resource Card and take it out of the track of Resource Cards, slide the order of cards down the track and fill the empty space with another card from the deck. Another unique feature in Risk Legacy is that after you win any battle you can increase the money value of a Resource Card on a track, which makes the economic struggles of a game more important and problematic. A Risk Legacy box contains 35 coins and 10 Coin Cards, which gives players great flexibility in how much value they wish to add on to Resource Cards. 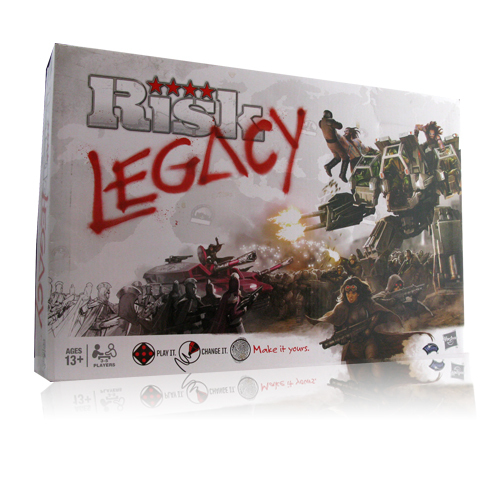 Risk Legacy is an amazing Risk variant that is spruced up through customization. This is the type of variant that relates to players who wish to expand their creative thinking past the original Risk game, making any choices they make on any given turn mean something more than just moving troops and claiming territories. 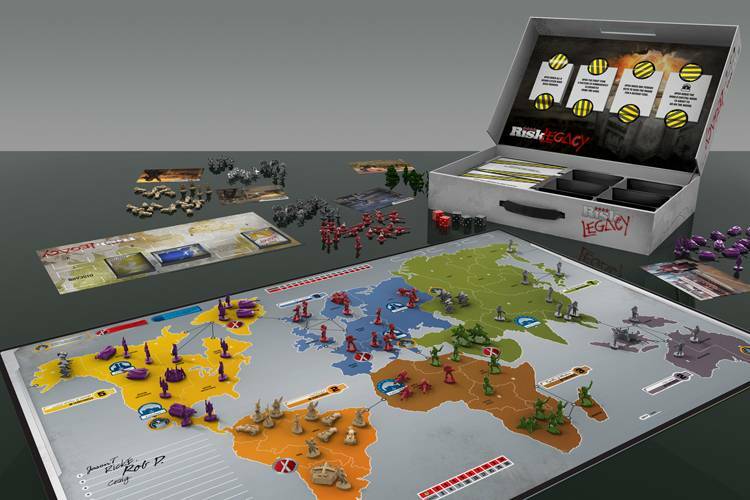 A single 15-game campaign of Risk Legacy follows its own unique storyline that is determined by the actions players either take or don’t take. If you are in the mood to play a challenging Risk variant, then Risk Legacy may be the game for you.